While I’d like to think there’s a script for “complete understanding”, there isn’t. There’s only the slow and steady work of growing in our understanding, and that is never something that is complete. I’m so thankful for grace. And compassion. And really great chocolate. The good news is, that there is help. And I hope, that someday when my house is rocking with two teenage daughters, I’ll be encouraged and hopeful, inspired and supported, ready to try the things we’ve put together to encourage others. It’s for parents who may want to go a little further in their understanding. 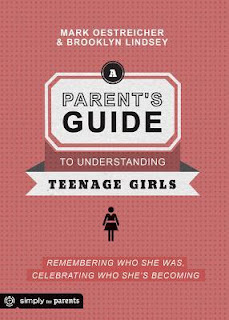 You don’t have to buy the book to receive it, but I hope that once you’ve receive it, you’ll want to read more about how to understand your daughter more. If you’d like the FREE PDF list of action ideas. Just follow these simple steps. Like “A Parent’s Guide” on Amazon. I’ll email the PDF to you on Monday. If you’re interested in Understanding Teenage Guys, here’s a good resource for you. Hoping to promote this book to the parents in our youth ministry! I’ve got four girls. Bring it on! can you send your email address? I’d love to share the 10 Actions PDF for you to share with the parents in your youth ministry!